This soccer exercise focuses on developing heading skills, deceptive movements to beat a defender and soccer specific endurance. Cones are used create an approximately 12x15 meters square. Four cones mark wall players' positions on the baseline. In this soccer drill we can use either average sized goals or smaller ones. 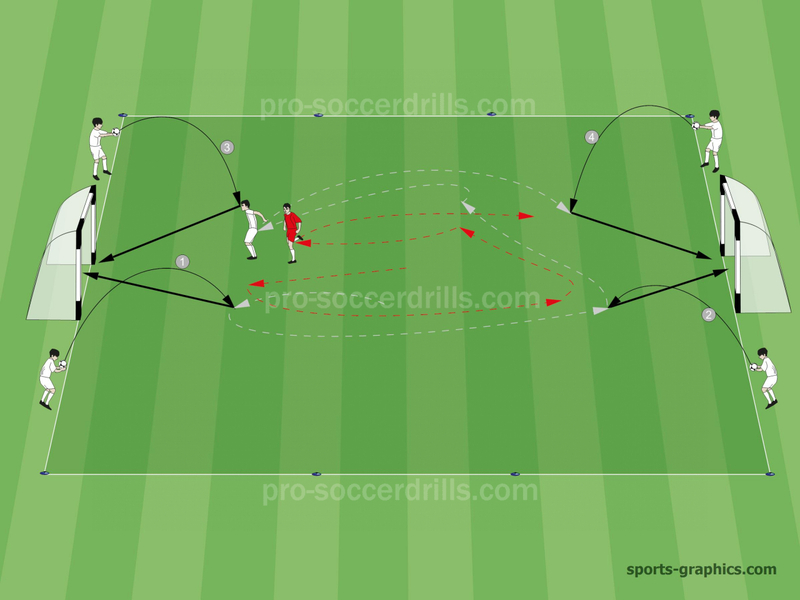 This small sided soccer drill can be played with or without goalkeepers. Players work and compete in pairs. Pairs change role after each completed exercise and change with wallplayers. One pair is in the marked area and four players are placed to the baselines as shown. Each four wallplayer holds a ball. One of the players from the pair in the middle is identified as an attacker, an other as a defender. Coach starts this soccer exercise. Attacker has the opportunity to move to the wallplayers in any order he wants. Wallplayers throw their ball to the attacker for a header. Attacker tries to score from each 4 thrown ball. Defenders’ goal is to set back the attacker and anticipate his deceptive movements to be able to react in a battle in the air.